I hate cleaning the fridge. Who doesn’t? With two little boys who like to poke around the refrigerator contents, spills and subsequent cleaning are frequent. 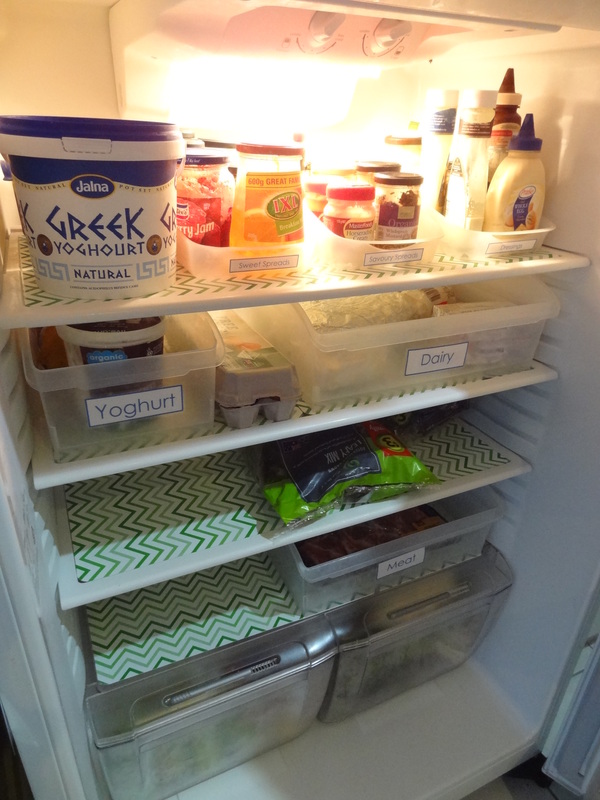 Sick of the mammoth task of removing all the food, lugging and washing the massive glass shelves, I decided to have a go at creating my own fridge mats. 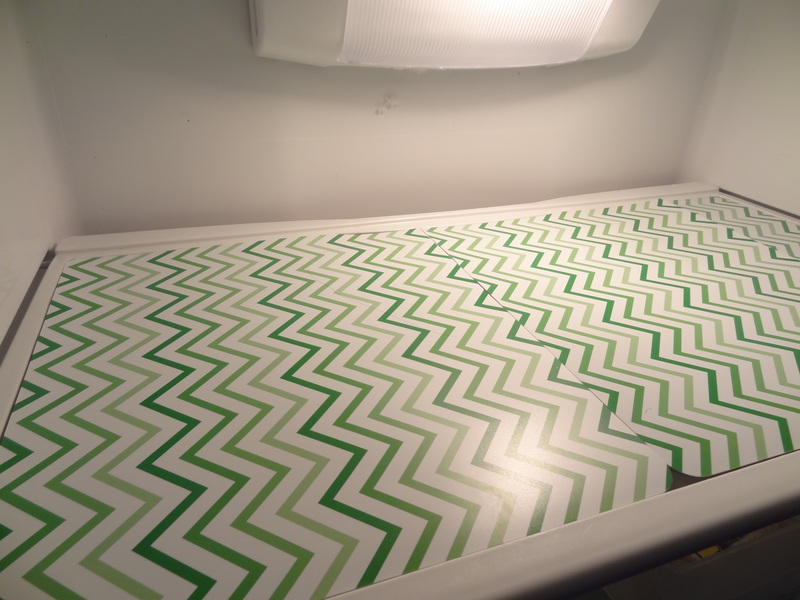 I found heaps of inspiration in cyberspace for DIY refrigerator liners. I settled on using thick plastic placemats for mine. 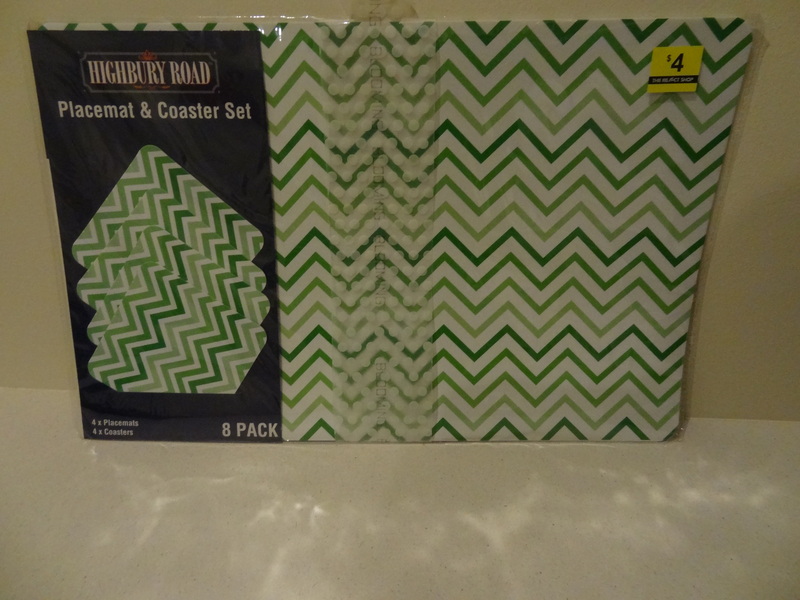 I wanted a nice bright print and picked up these green chevron placemats and coasters at the Reject shop for $4 a set. 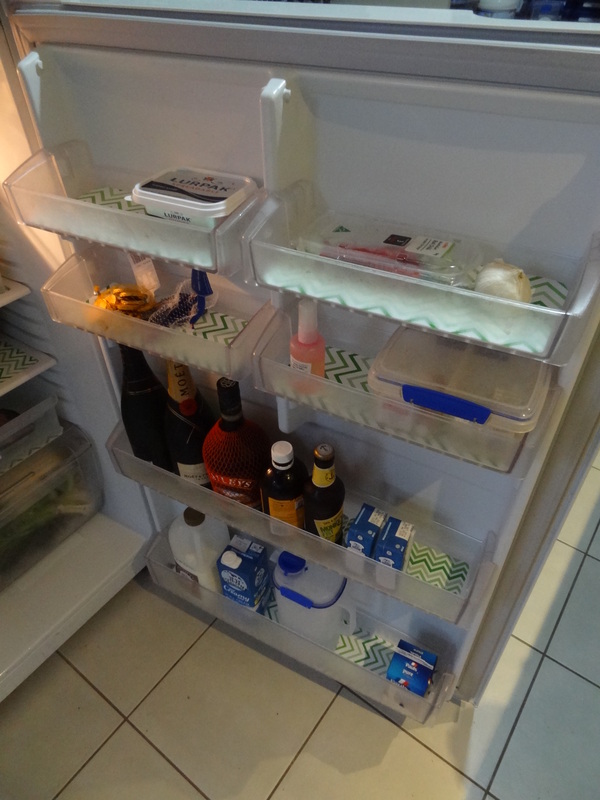 As my refrigerator shelves are so wide, I needed 3 packs of placemats to do the job. 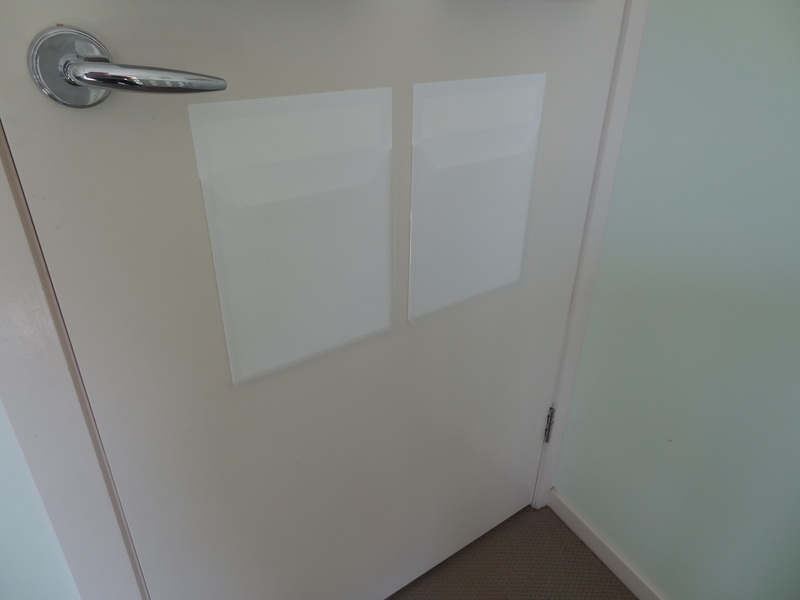 I carefully measured and cut the placemats to suit my first shelf and used these as a template to complete the fridge. It really wasn’t that big of a task. It was a little fiddly to get the initial measurements right, then it was smooth sailing. I just love how clean, bright and fun the inside of my refrigerator looks now! Unfortunately, the pictures do not do the project justice. We are having horrible weather here and there is no light to photograph in. The placemats have nicely ‘clung’ to the glass shelves and do not move around when shifting items. Now when a spill occurs, instead of having it turn into a giant cleaning task, I just remove the placemats, give them a quick wipe down and return them to their place. I just love completing a small project that I know will save me time and energy. The fact that it has also livened up my fridge is a happy bonus. For the last week I have been on a mission to organise those annoying bits and pieces about the house and garden. 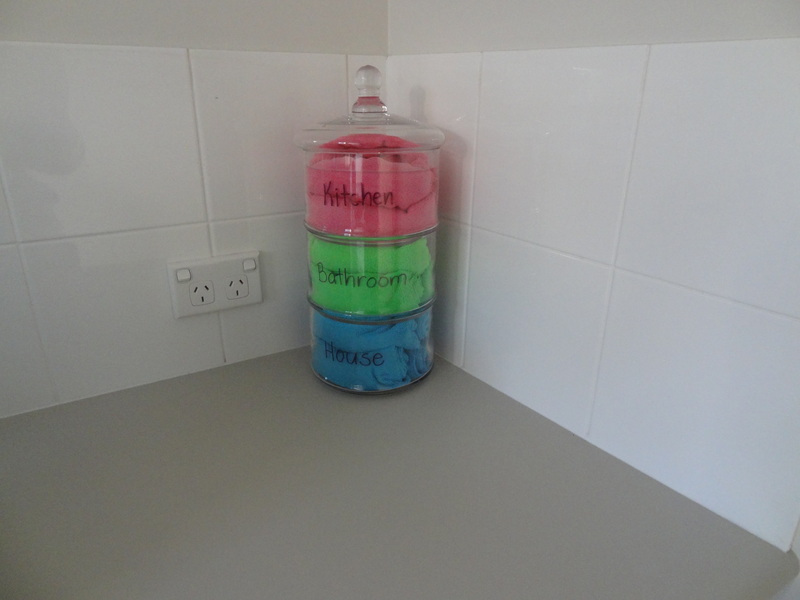 I hope to pop some posts up about these little projects because even if your abode doesn’t suffer from the same annoyance, you might get some inspiration to help you with something about the house. 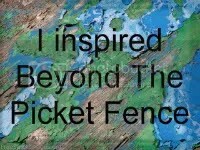 I know that is often how I get my ideas on how to tackle things. Today I focused on the tackling some kid’s mess. My 4-year-old loves activity books. 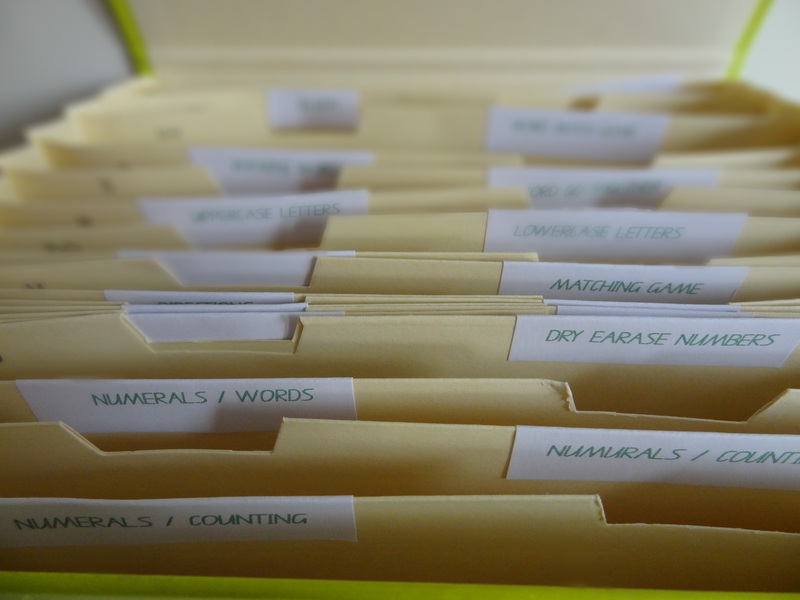 You know the sort… with pre-writing, easy letter or number activities? A while back I bought a whole heap of them on sale and they each came with a set of flash cards. He has every conceivable set available – numbers, letters, words just to name a few. I had these stored in a basket but the boys had got into it for some card-throwing fun. All the sets were jumbled and their cardboard cases squished. They needed some organising know how. 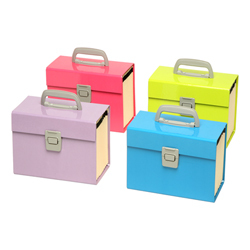 Not too long ago I picked up one of these very cute A5 accordion file at Officeworks for just a few dollars. I loved the green colour and knew something or other would benefit from its addition to the house. 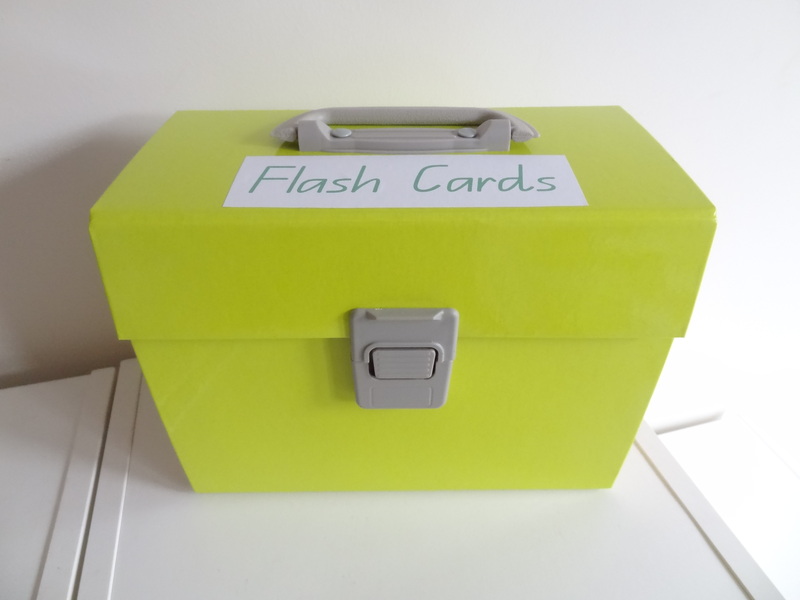 Enter the flash cards. After spending a ridiculous amount of time rearranging the cards into their packs, I slotted them into the file and labelled each section. Now the flash cards are secured inside, no accidental drop will send these babies flying. The box also has a handle which makes it easy to move around the house. 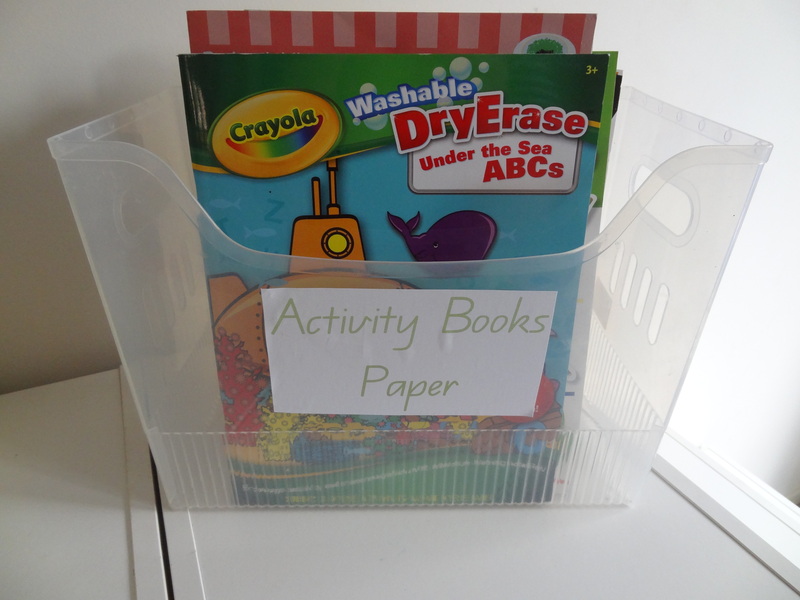 As for the activity books, they had been kept messily in a drawer. 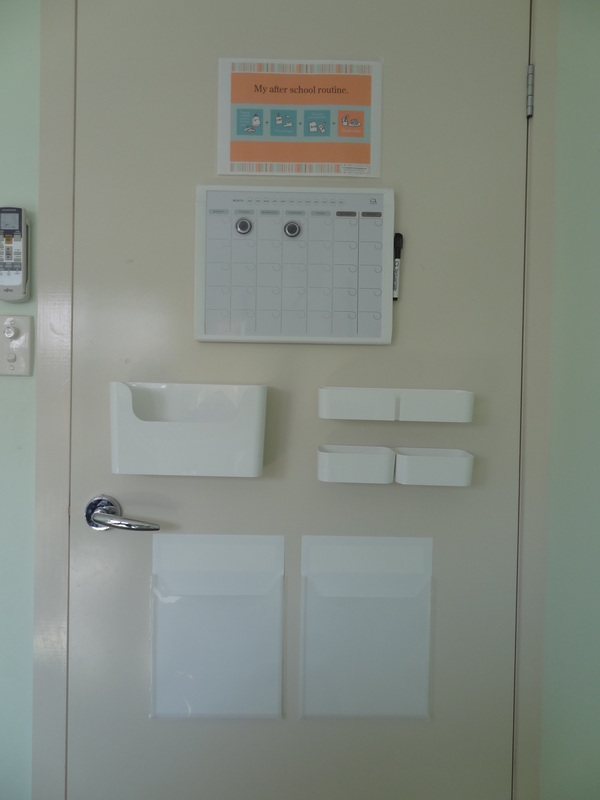 I thought it best to pull them out and place them into something that made them easier to see and access. 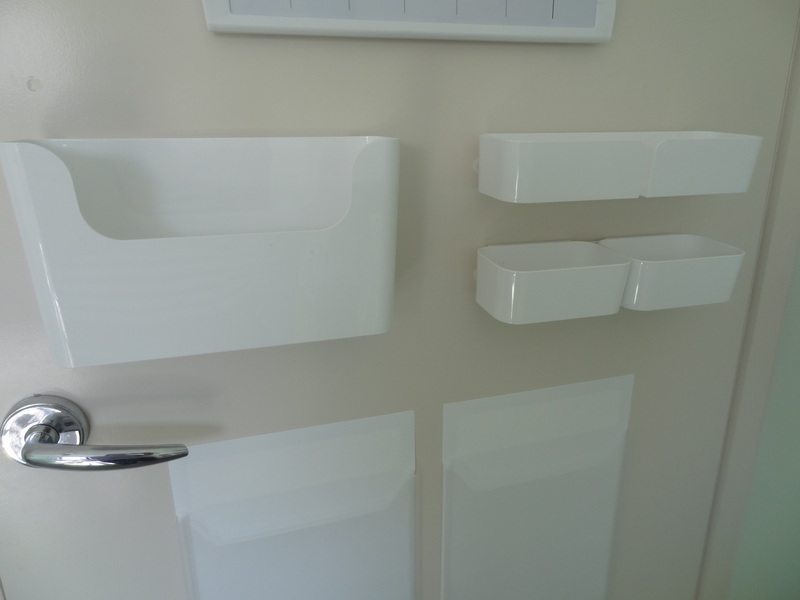 I rummaged through my storage cupboard to find a Mimi Separator from Howards Storage World. 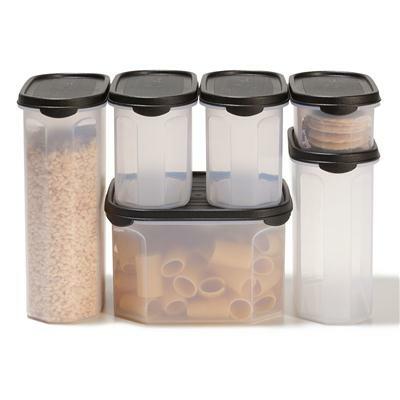 I had used it to store things in my freezer of all places but it was no longer needed. Now that these things are neat, I have decided that they are more than welcome to stay out. I found a place for them in the kids’ playroom. 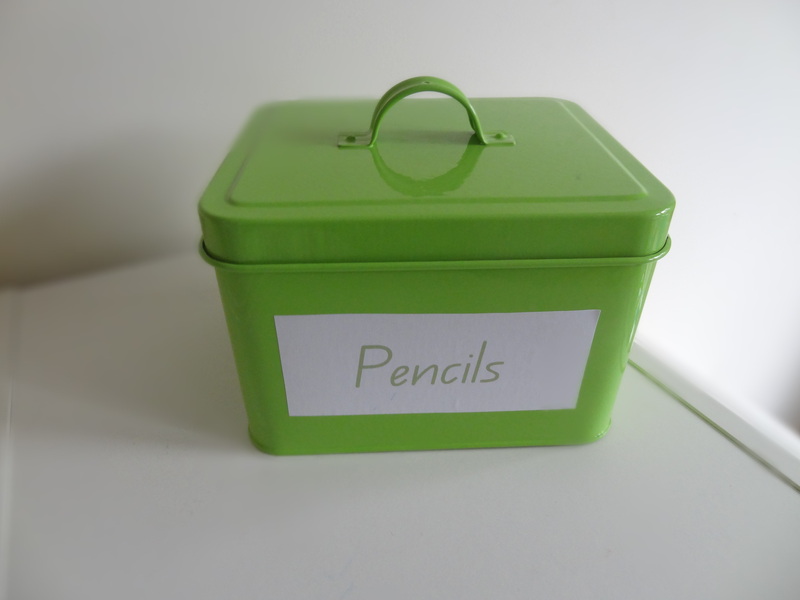 By adding this cute container that once had a life as a recipe holder, I added some pencils and made a little station for these activities. 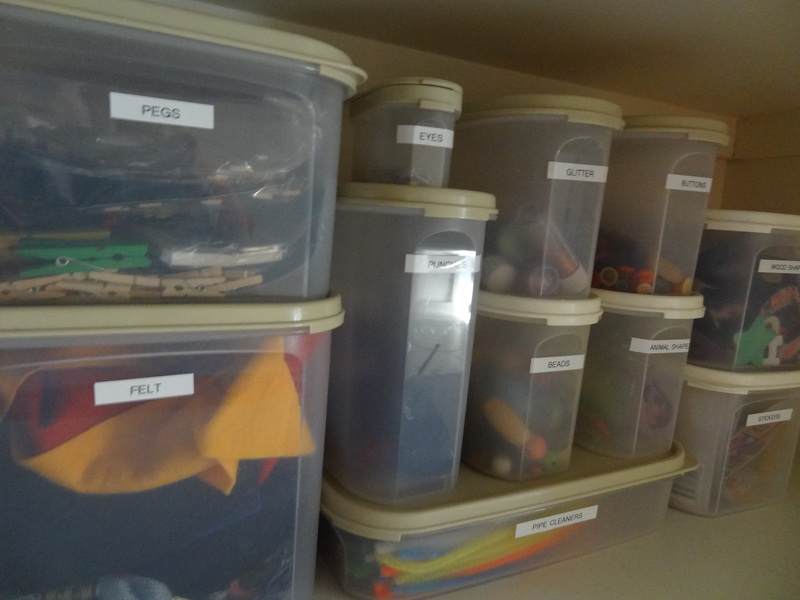 I love it when you find a nifty solution to your organising problems. 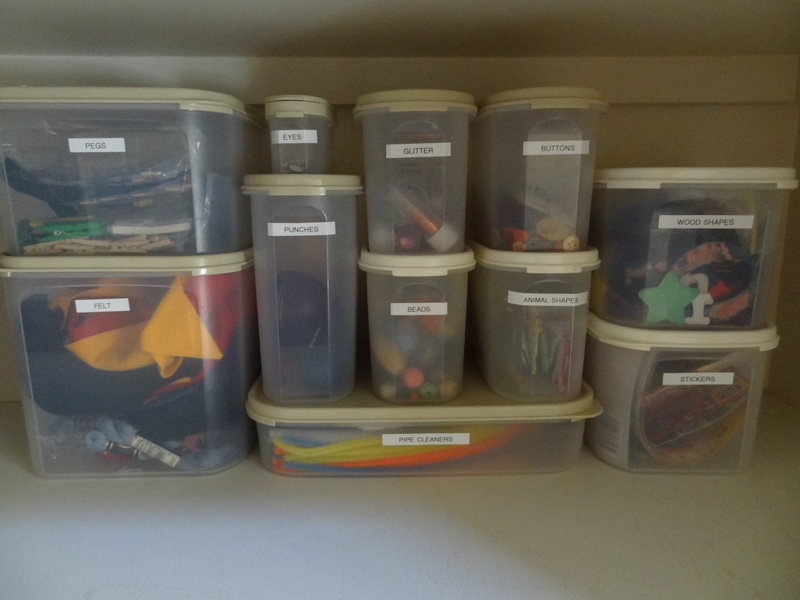 Especially when you find the solution amongst the items making your storage cupboard messy. It is like killing two birds with one stone! 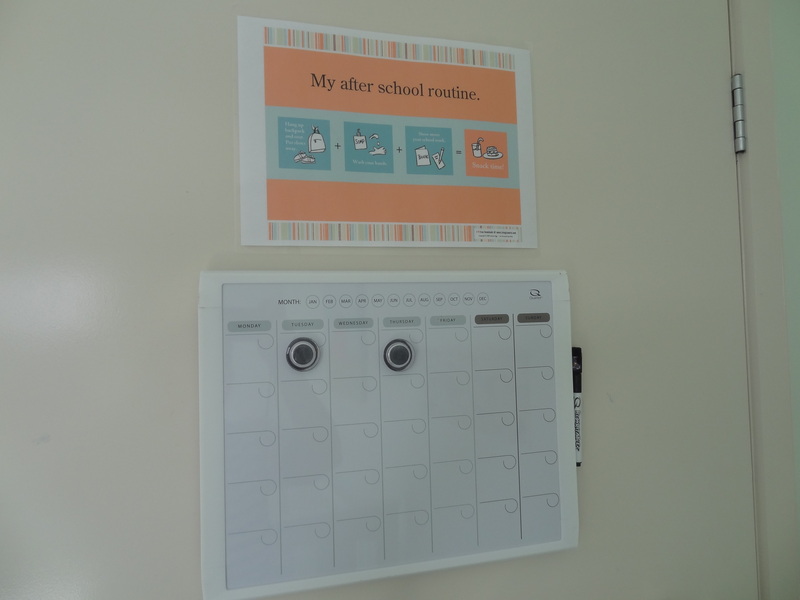 As Kindergarten approaches last term and primary school starts next year for my eldest, we know our relatively ‘carefree’ parenting days are over. Around the corner looms homework, permission slips and assignments, just to name a few. At the moment, most of the paperwork that comes into the home from school is managed at the fridge – with magnets, or worse, is kept in the car glovebox! It is beginning to look messy and things are being forgotten. Increasingly the tasks sent home require some action from my son and I wanted these pieces to be more accessible to him. So I set out to create a drop zone for all this ‘stuff’. I decided the best place to keep this was on the back of his bedroom door. That way it wasn’t taking up precious space in our living areas and it was accessible for my son. Here is what the completed zone looks like. The zone is made up of ….. Plastic file holders (Martha Stewart Large Vertical Plastic Pocket) . One to hold general school paperwork like newsletters and tuckshop menus, the other for classroom paperwork like homework. 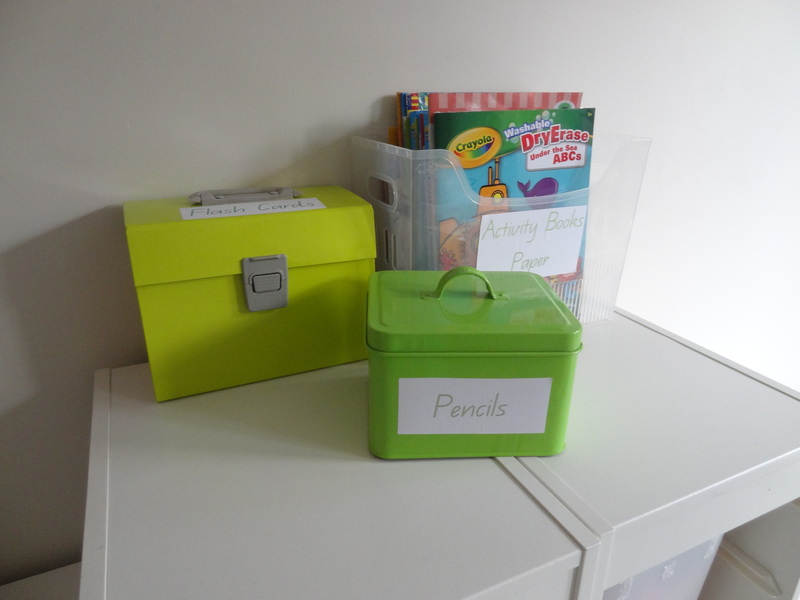 I have started to transfer the paperwork from my various ‘filing’ areas into this zone – a useful project as I found out that I am meant to be a fundraiser this weekend! I am looking forward to testing its full usefulness beginning next week. I gave away the whole nappy bag caper quite some time ago. I hated that thing. It was undoubtably premature, my youngest isn’t yet two and is still in nappies. It has led to some very embarrassing and annoying events like my son doing a number two, five minutes into a play date and I didn’t have a spare nappy or packet of baby wipes. Or the time I picked up the kid’s spoon I hadn’t yet cleaned and placed it, complete with yoghurt blob, into my handbag and on top of my favourite designer purse. So it was these school holidays that I decided I needed to get my act together. 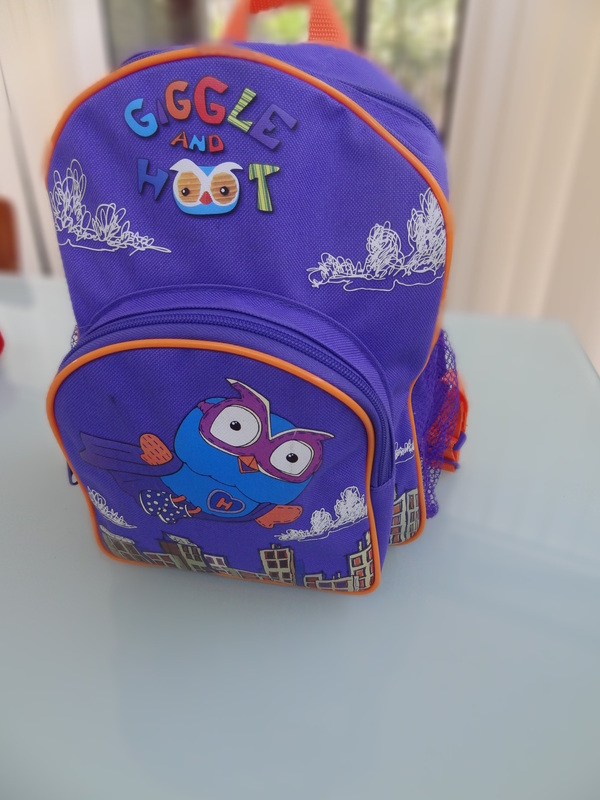 I assembled my outing must haves and placed them in a kid’s backpack. 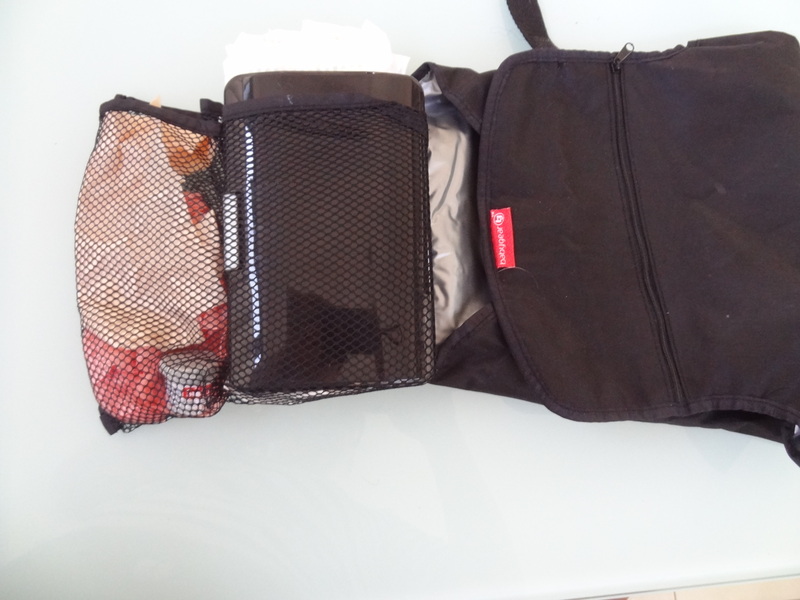 Eating out Pack. I picked up this three sectioned pencil case on clearance at Target. 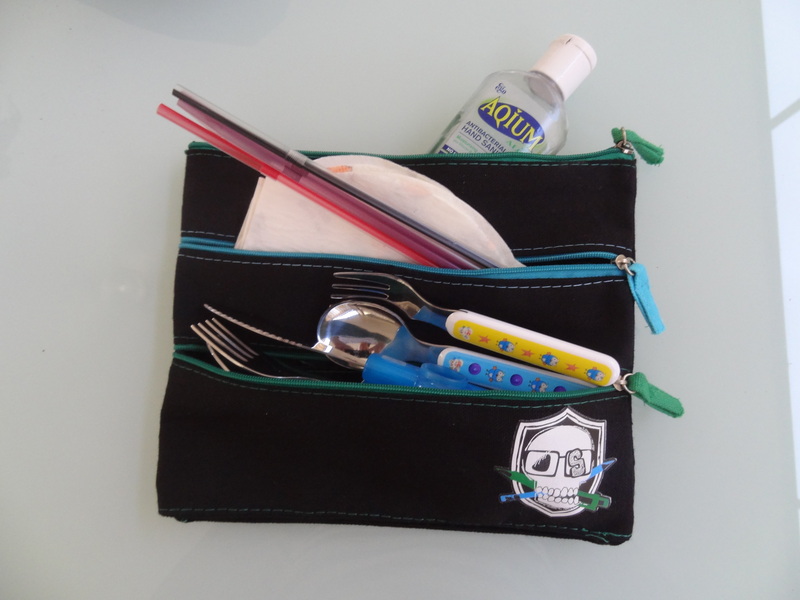 It holds my children’s cutlery, plastic straws, disposable bibs and hand sanitiser. I often throw the stray sachets of sugar, sauce and salt in here too. You never know when they might come in handy. The cutlery set I love to use when out is Fuel Primary Snap Flatware. It niftily snaps together for easy and compact transport. Kiddapotomus Tiny Diner Placemat. I love this thing! I have always hated the idea of my kids eating at restaurant and food court tables. I don’t think they are particularly clean and kids always drop their food. This is the solution. 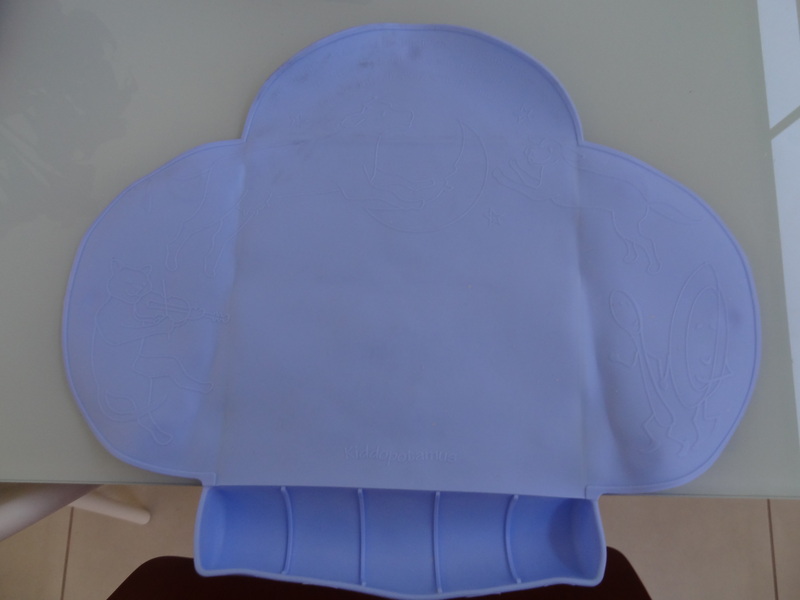 It is a suction-capped placemat for kids. It is wide enough that their hands and food won’t touch the table. 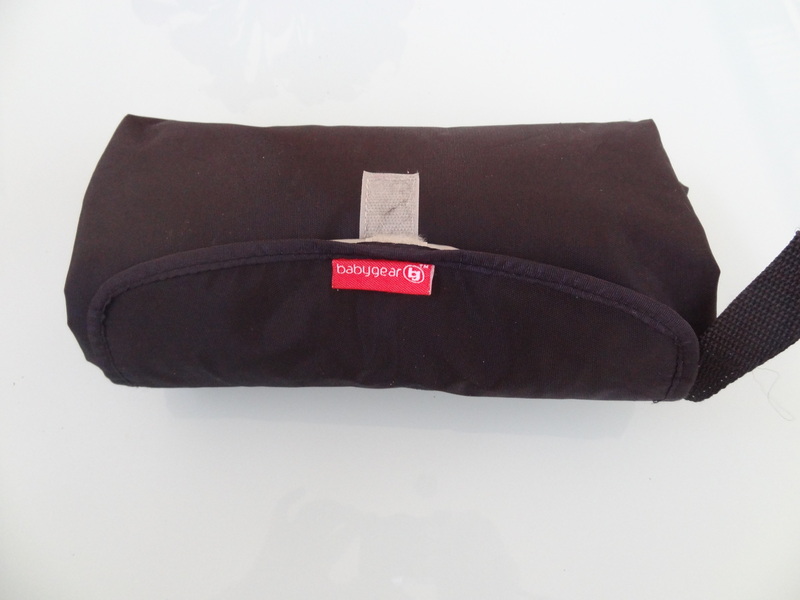 It has a nifty little channel to catch any spills which doubles as a holder for the mat when it is rolled up. Enjo Little Laundry Pack. Another love of mine! 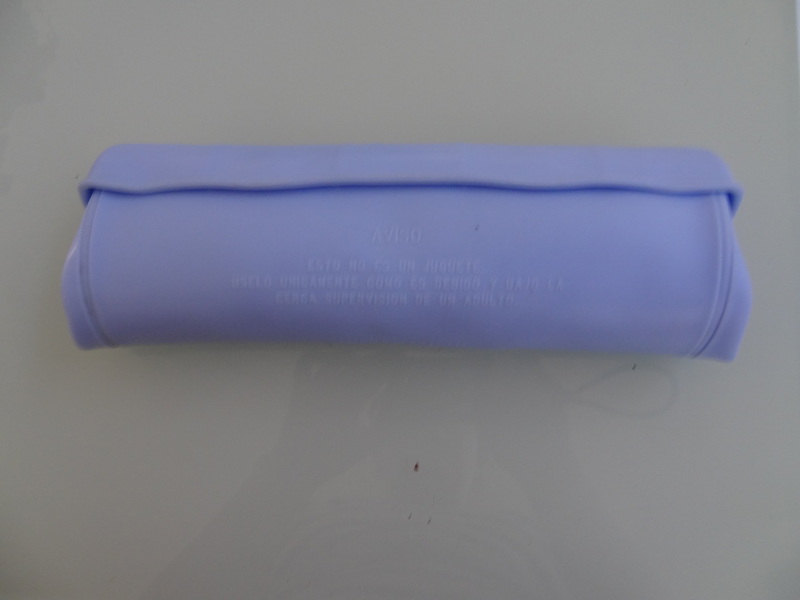 This little pack will remove any spill on your clothes while you are out. 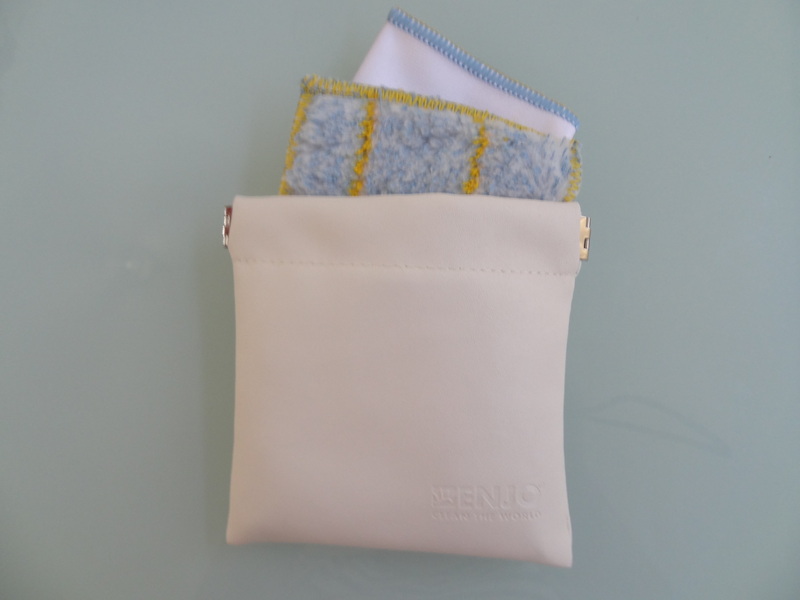 It comes in a nifty little pouch with a travel sized fabric fibre and miracle cloth. A true lifesaver and means I don’t have to carry a change of clothes around in this bag. For those too-big-to-ignore clothing problems, I keep a change of clothes in the car kit. 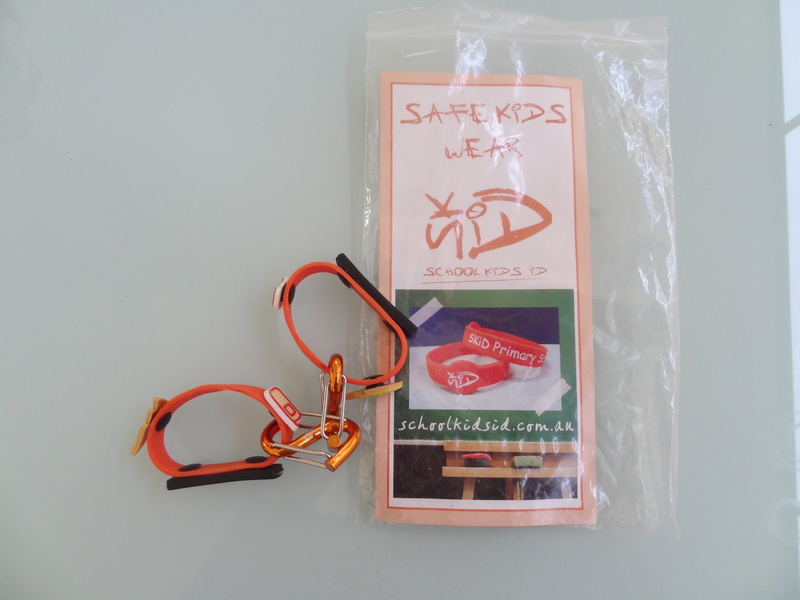 Kids’ ID bracelets. I pop these on the kids whenever we go somewhere with big crowds. It has my mobile number on it just in case they become lost. You can pick these up from lots of places on the net. Baby wipes. 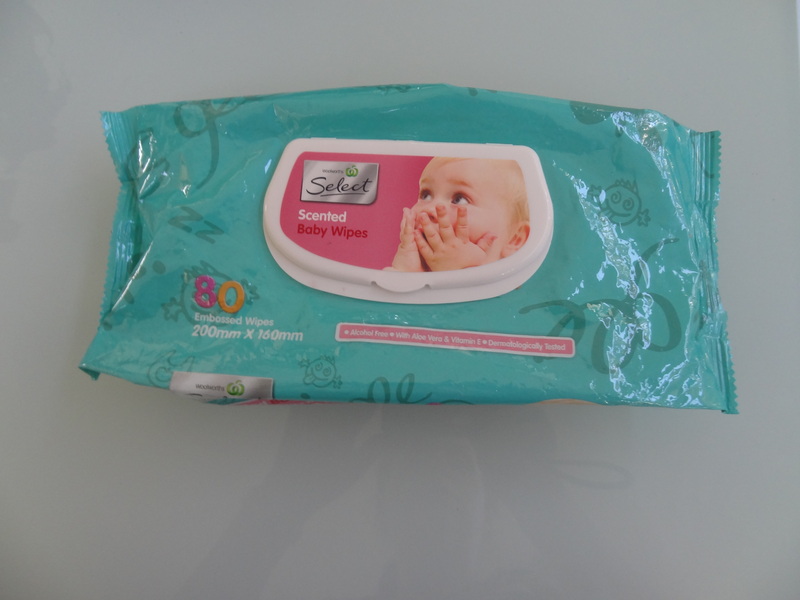 What would we do without baby wipes?! The only thing I don’t carry in here that I would ordinarily pack in a bag such as this is sunscreen and insect repellant. As we live in a super sunny part of the world, I have found it easier to keep large pump packs of sunscreen and insect repellant in the boot of our car and use it before or after we arrive at our destination. 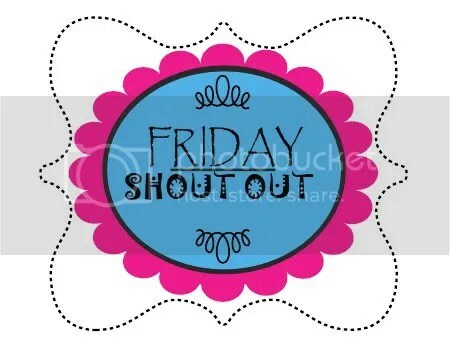 The weekend has left the Crooked Household….well…..crooked. Today is one of those days, where you can see there are a million things that need to be cleaned, done and fixed, but you just don’t know where to start. You know there is no chance that you will get everything done and the whole thing is making you annoyed. It’s on days like this you need to do your Feel Good Clean before you tackle anything else. You know what I mean, the cleaning tasks that take little effort but show big gains. The tasks that instantly make your house feel lighter, cleaner and less cluttered. The tasks that make you feel better about your home. Everyone’s Feel Good Clean is different. If you haven’t really thought about what those cleaning tasks are for you, they are most probably the ones you rush to when you get a last minute house guest. Today I thought I would share with you my Feel Good Cleaning tasks. 1. Vacuum. Since having children and all the floor mess that comes along with them, I have perfected the art of the quick vacuum clean. Heaven help the toy or child that gets in the way of Mum with the Dyson. 2. Mop. Again I have perfected the quick mop. 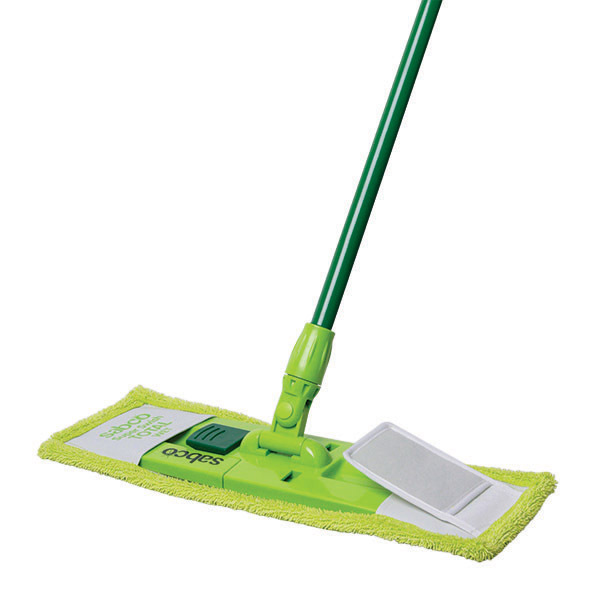 When I want fast results I use a microfibre mop head with just a spritz of water. The floor is cleaned really well and it is dry and ready to walk on in a minute. 3. Make the beds. 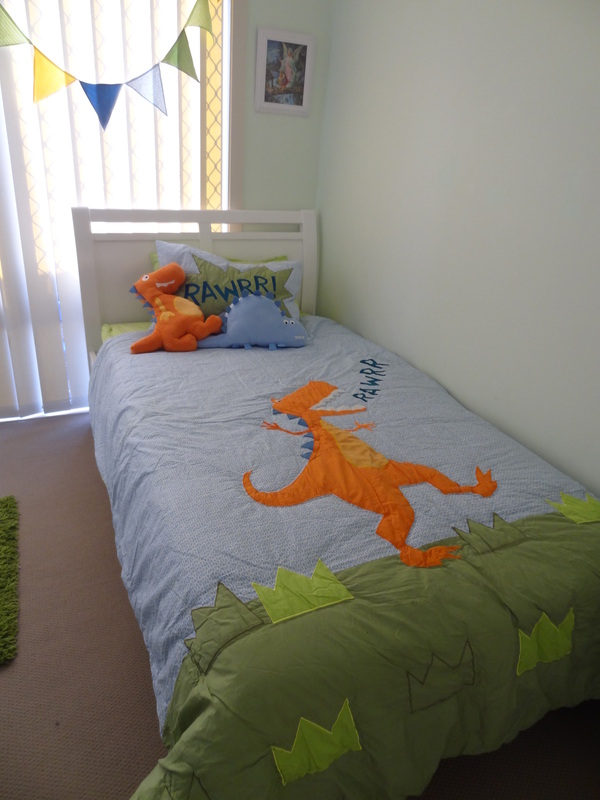 Don’t worry, we always make the beds, but it is on my Feel Good Clean list as it instantly makes the bedrooms look neater. 4. Tidy the kitchen benchtops. We have an open plan house so the kitchen is visible from the living areas. By removing the everyday clutter – books, loaves of bread, dishes and appliances, I feel the house is less cluttered. 5. Polish the dining room table. Again, as we have an open plan house and a glass dining table, the sticky little finger marks from meal times are visible to one and all. 6. Straighten couch cushions and floor rug. Nothing entertains my boys more than messing with the couch cushions and sliding about on the rug. Straightening them will most likely last about 20 minutes, but for those 20 minutes, my lounge room looks good. 7. Clean the windows. The rear of our house, the living area, is almost entirely made up of glass. 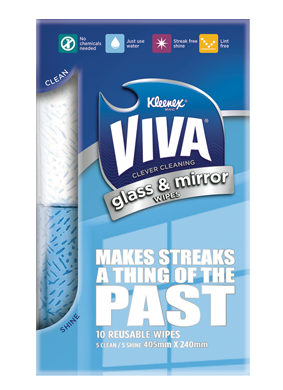 When I do a Feel Good Clean I choose one or two sections of glass and give them a polish. 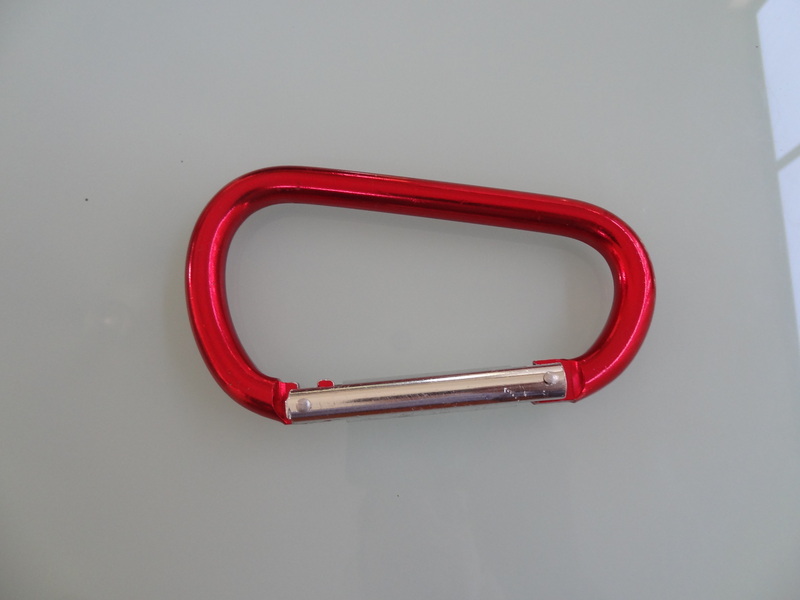 You can read how I have made cleaning window’s easier here. Nothing makes me happier than looking out of my freshly cleaned windows. Weird, huh? I did all of these jobs in just over 30 minutes this morning. 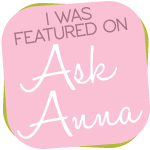 I was a whirlwind, but at the end of it the house looked neater and I felt a whole heap better. I also scored some bonus cleaning in that time by warning the kids I was about to vacuum and mop. They instantly jumped into protection mode, packing away toys and parking them on their play mat. Score! What are your Feel Good Cleaning jobs?